Language, Ethnicity (up to three) and Occupation are selected from standard lists. When you enter text into these light yellow boxes you will get a filtered list. Select Account holder(s) from existing patients or organisations. Enter text into that orange box and press [Enter] to bring up the patient search list. 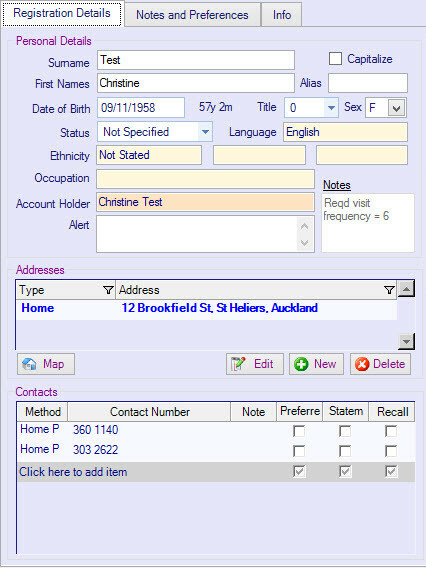 Information entered into the Alert field will be displayed every time the patient’s details or clinical notes are searched. You can enter any number of addresses, contact numbers, schemes, family members and relationships. If we suspect you are entering duplicates patients, we will alert you. New patients are compared with existing patients with the same first or last names and same date of birth and gender.